When I began my first occupational therapy job in a skilled nursing facility, I became aware of how difficult it was for some family members to visit loved ones that had significant memory loss associated with dementia. They felt awkward trying to make conversation with someone who could not remember past events and details that they use to enjoy reminiscing about. Our multidisciplinary team began to explore ways to bridge this gap of communication and make their visits more enjoyable for all. 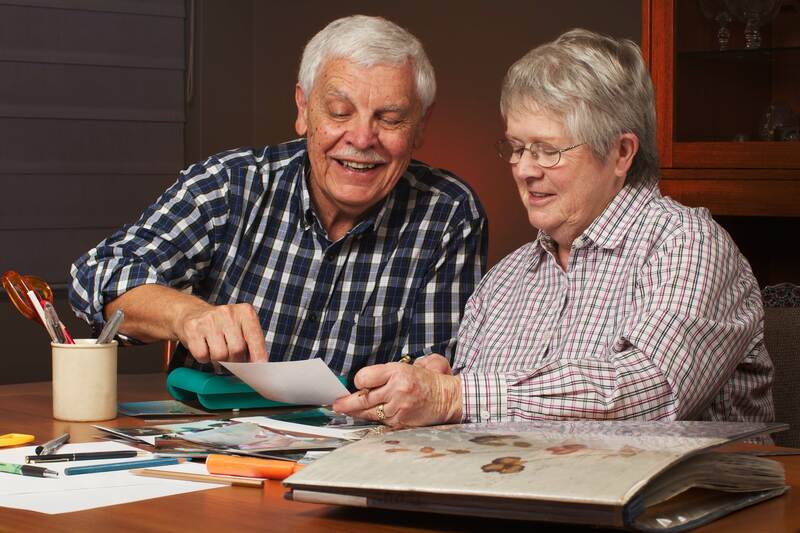 We eventually invited family members to come together for an informal meeting to develop memory books. These were made of 4 X 6 cards hole punched together or cardstock pages put in a binder. Each family was given a collection of ideas/topics for their book that would be individualized and meaningful to their loved one. The pages included such topics as, “I was born in . . . . . . .” , “I had 3 sisters named . . . . . ., “My children’s names are . . . . . . .”, and “I worked as a postal carrier for 30 years”. Pictures on these pages were an added feature and families tried to pick topics/pictures that were familiar and that their loved one could relate to with pleasure. Now when a caregiver or family member came to visit, they could pick up this book and look through it with their loved one and truly enjoy their visit together. No time for such a project? Involve a middle school grandchild or college age student who loves to be creative. Computer savvy family members would enjoy creating a digital scrapbook. Just make sure the pictures chosen are large enough and have enough clarity that your loved one can easily identify them. Make the print easily readable but keep your sentences short. I met a young woman who had recently moved her mother into her home from another daughter’s home. She asked me why her mother carried around a photo album from room to room, everywhere she went. I told her it was because it was one familiar thing she still recognized and cherished. Maybe your new memory book will become that precious possession!